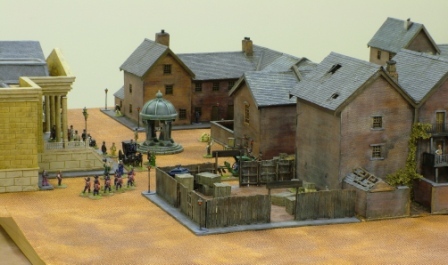 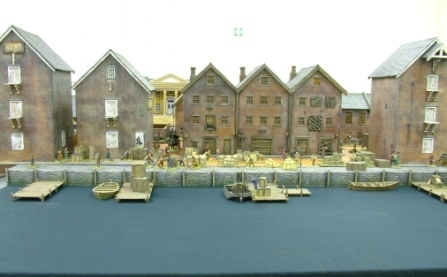 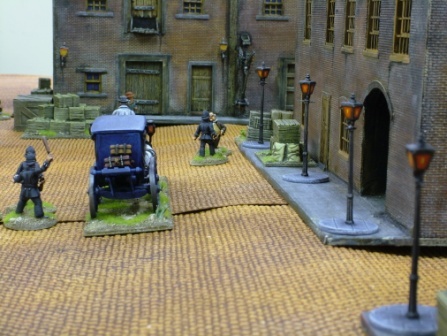 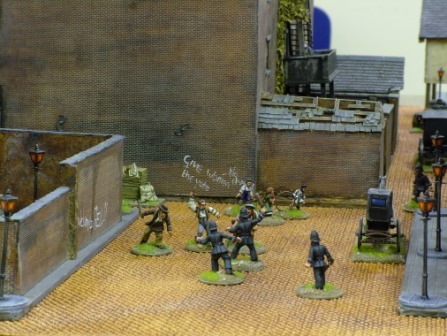 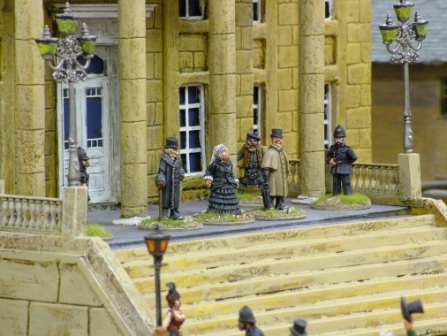 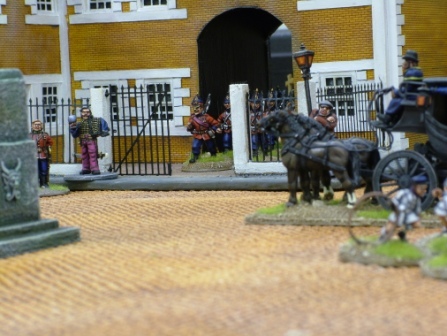 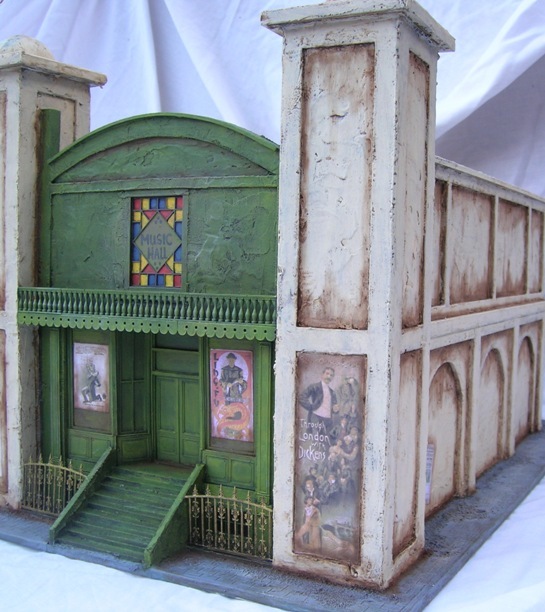 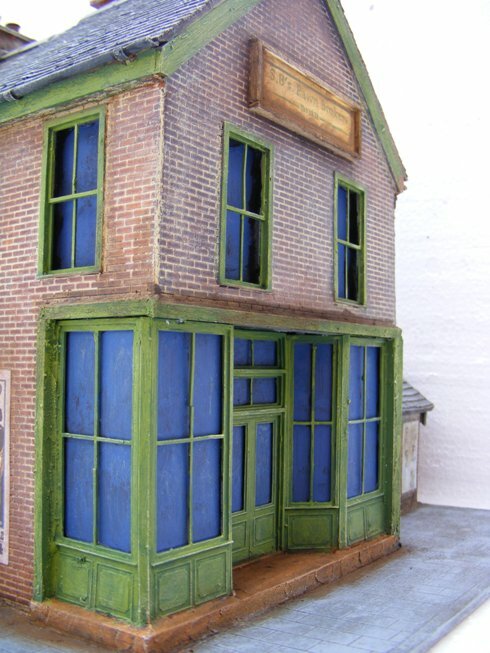 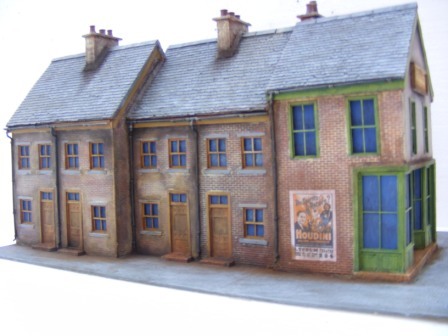 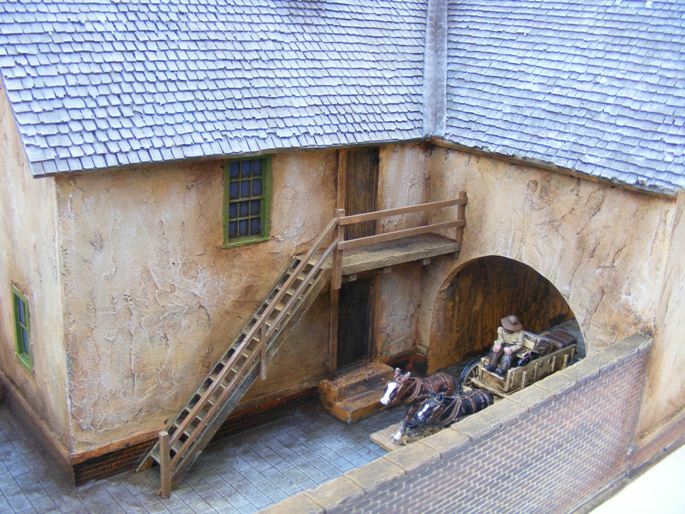 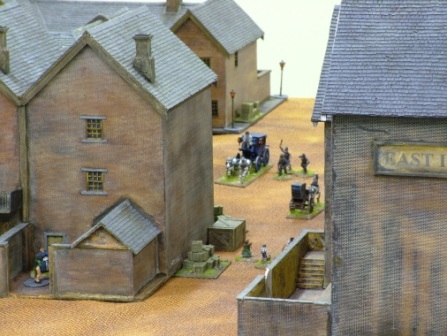 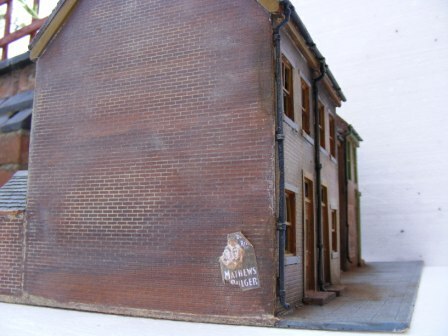 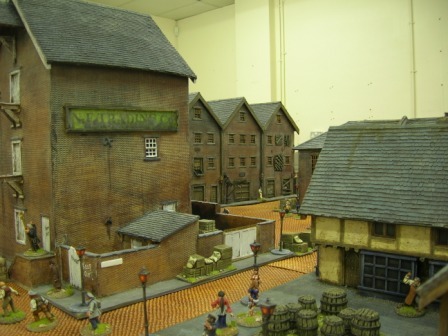 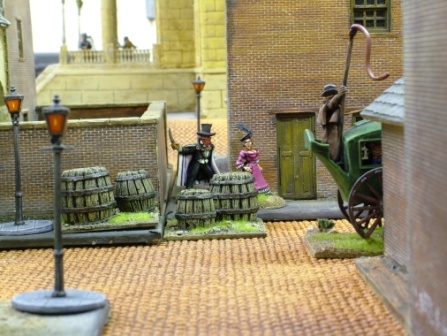 TMterrain has been commissioned twice to recreate parts of Victorian London. 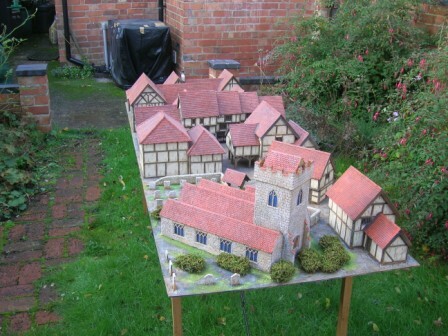 I was asked both times to spread the project over months and to deliver a building every month or two. 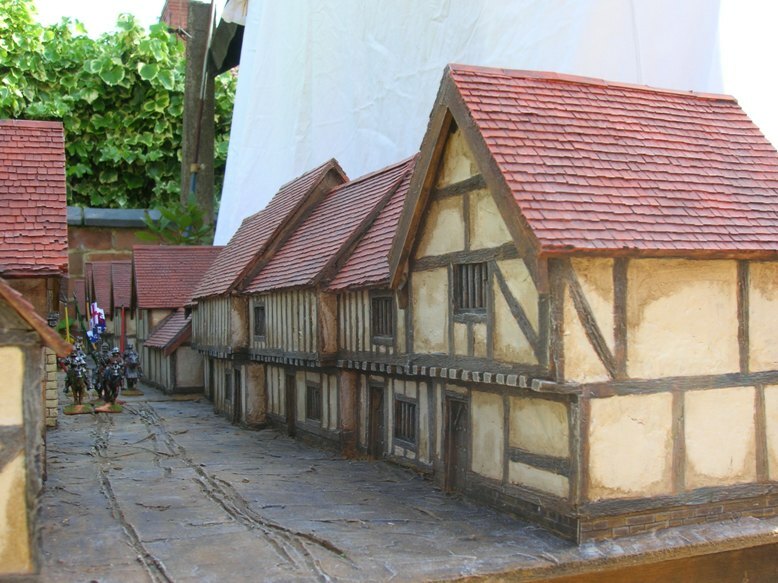 It is agreat way to spread the cost but it also allows you to order a structure as you work out you need it rather than trying to anticipate what you might want. 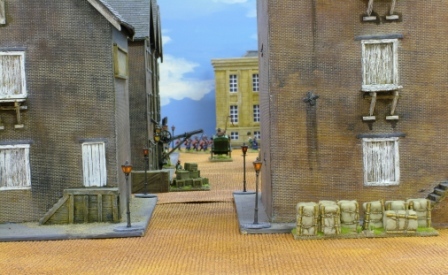 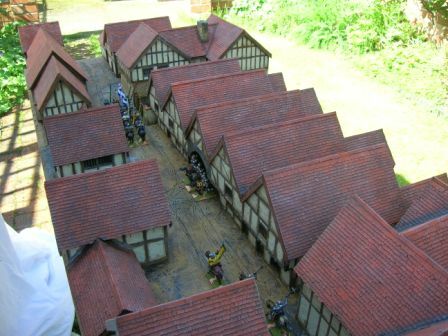 Both commissions are in 28mm scale and many of the following pictures are supplied by Wargames Illustrated magazine taken during a photo shoot and were published in the magazine sometime in 2008. 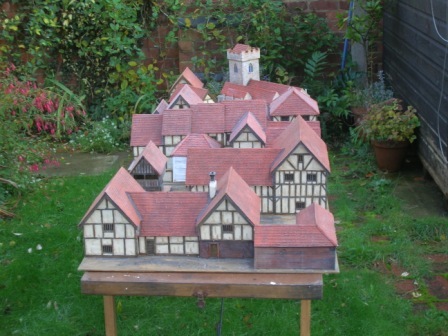 I will from now on group the two projects together into one so I don't confuse myself! 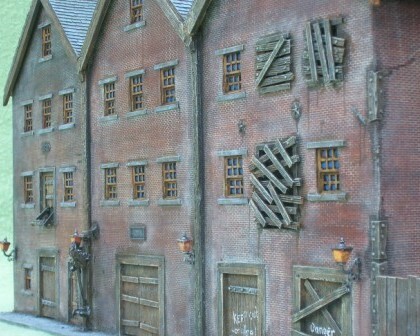 The first buildings I did were warehouses. 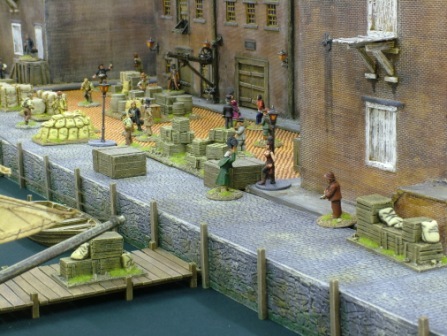 You get alot of building for your money and they do portray the image of the London docks- the Thames lined with these wonderful looking industrial structures. 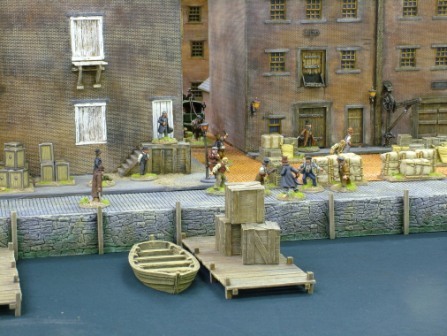 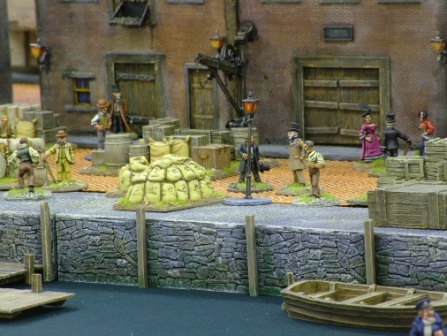 They seem to sit on the river bank and look menacing- just the thing you need when you are playing a Sherlock Holmes game or chasing some steam powered robots in an alternative Victorian history! 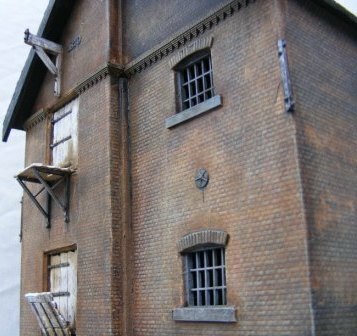 The next on the list was City Hall. 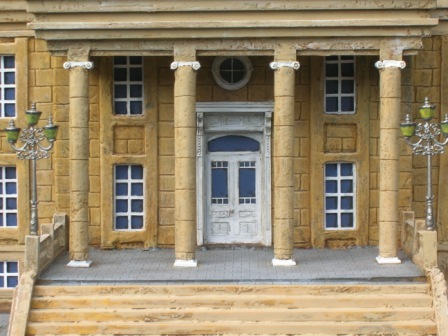 I couldn't make a complete City Hall as it would be enormous so I made a facade only. 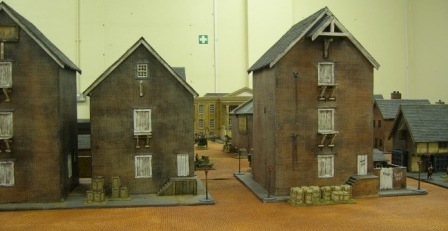 It has to go on the edge of the table as there is no back to it. 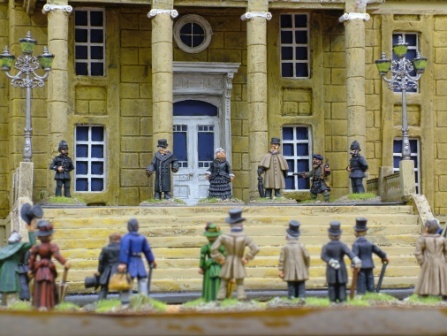 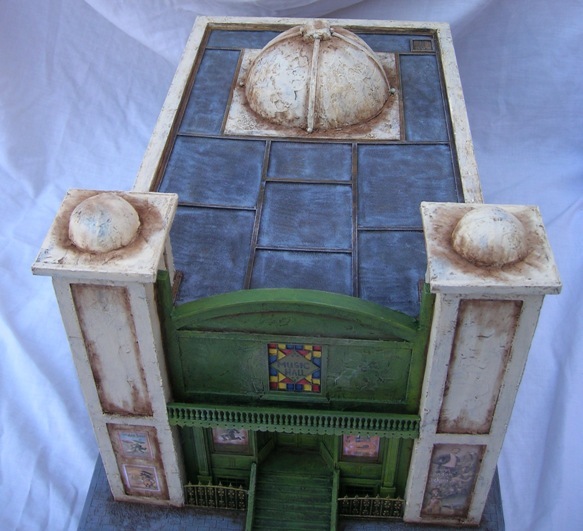 The pillars and windows are resin, the lights come from Langley models (they are 1 /72nd scale so I raised them on plinths to make them look the right size)and the entrance is a Victorian doorway by Grandt Line. 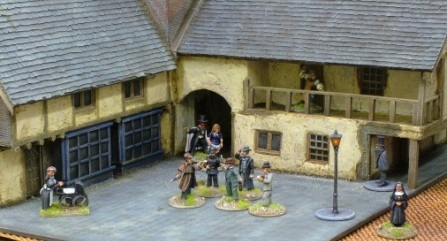 The great thing about this building it fits right in with a gangster shoot out in 30's Chicago! 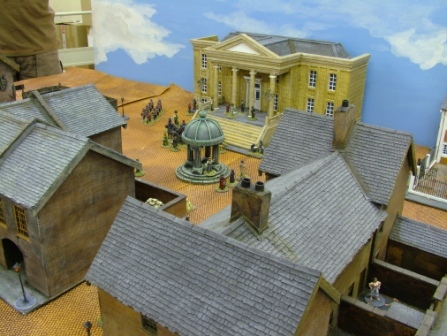 London had some commerce and admin buildings now it needed housing, entertainment and a customs house.The customs offices were another facade designed to go on the corner of the table with brass etched railings enclosing a small front yard. 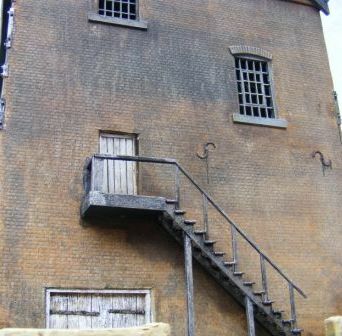 I made it clean and new looking on purpose to make it look powerful and rich! 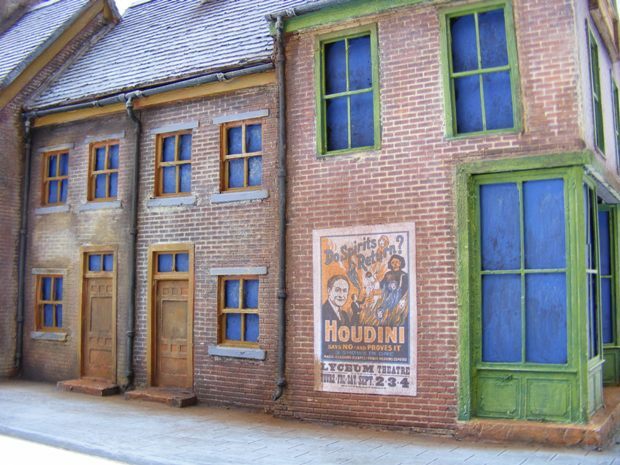 The entertainment 'quarter' has a Music Hall and a couple of pubs. 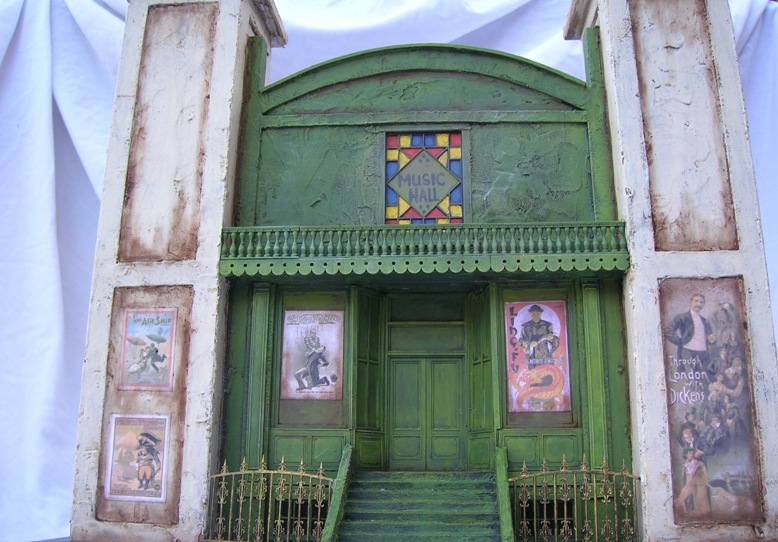 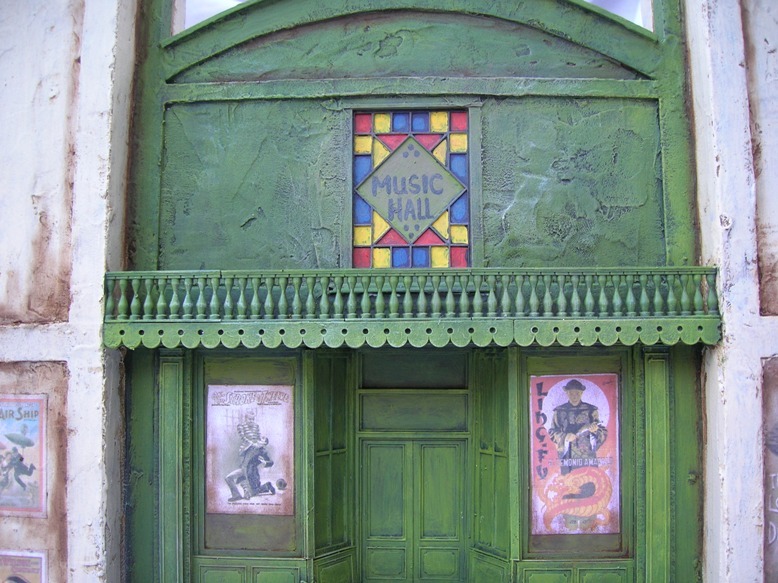 I found it difficult to find pictures of the outside of music halls (lots inside- I guess they were proud of how they looked for the paying customers!) 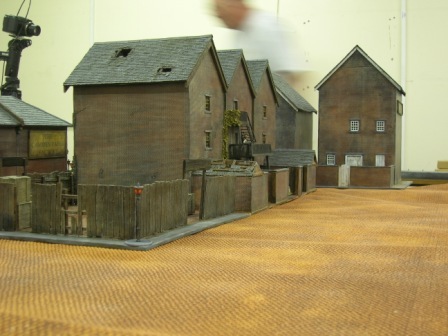 so it was a bit of guess work and Hollywood! 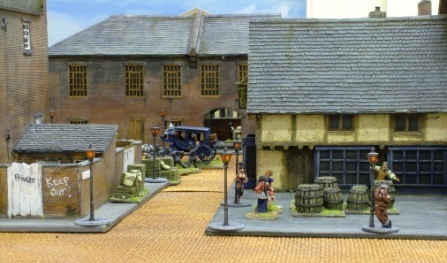 The pubs are two very different buildings. 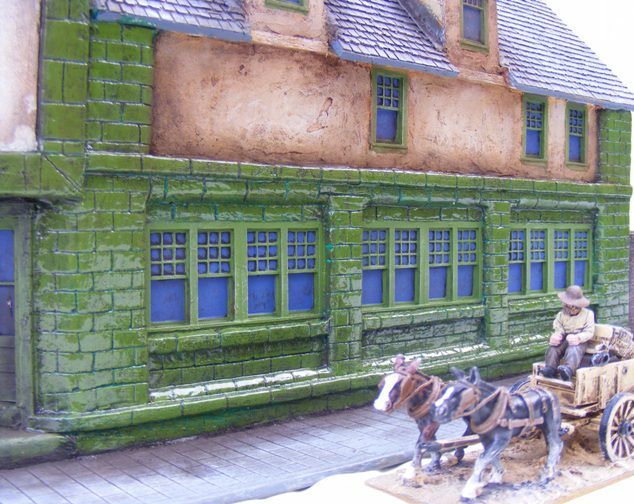 One is based on the pubs you can still see in London with the glossy tiles and welcoming windows. 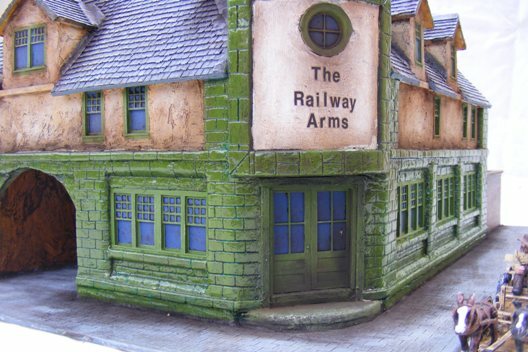 The windows are Grandt Line windows and the pub name comes from a set of transfers. 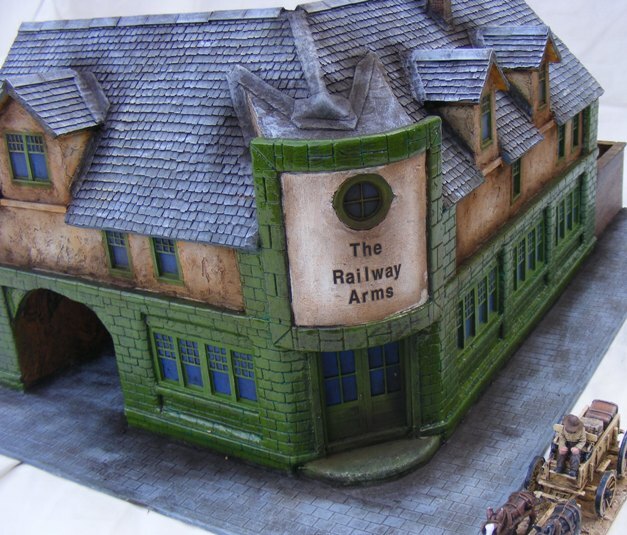 The second is a more down market pub completely out of my imagination. 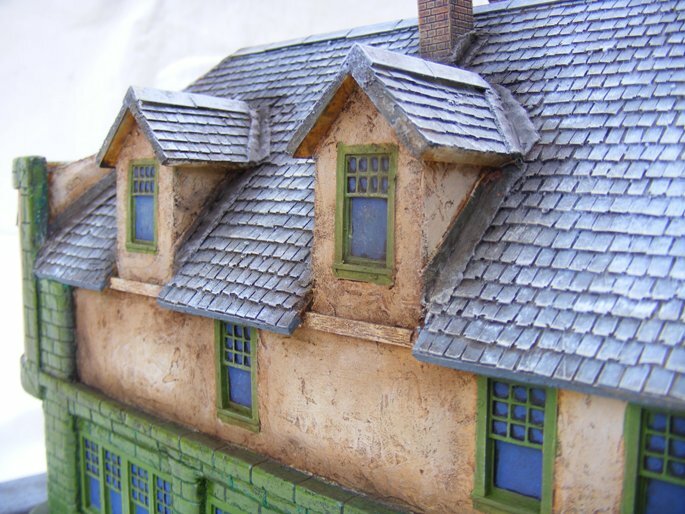 Both buildings have tiled roofs made from my sheets of resin and both roofs do not come off, just like the rows of houses. 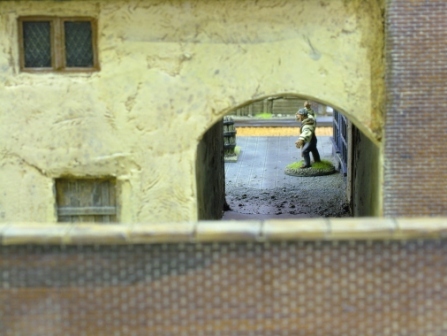 Finally, the photo shoot for Wargames Illustrated furnished me with lots of panoramic shots of the city. 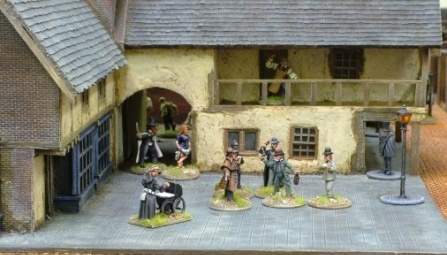 Here are a selection of them.